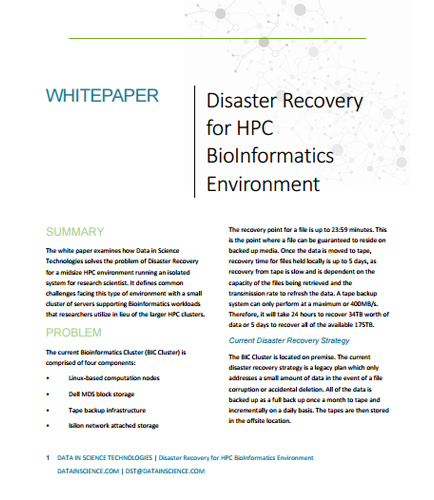 "Strategy for Disaster Recovery Plan in HPC For Bioinformatics"
The crux of disaster recovery planning is a detailed recovery plan based on a disaster recovery strategy tailored to the HPC environment. When things go awry, it's important to have a robust, targeted, and well-tested Disaster Recovery Plan. What are the steps taken by the larger strategic Disaster Recovery Plan which can be invoked to provide a limited set of benefits in a disaster situation? What are the common challenges faced by HPC Environment for the Disaster Recovery? What is the main purpose of a Business Continuity and Disaster Recovery Plan?